Finally, a magic story with, well, magic. I tried to read a few fantasy books a few weeks with witches in them, with the only thing lacking was, er, witchcraft. This is the second in the Harry Dresden series. Harry's in a pretty bad bind. His wizard business isn't going well, Karrin Murphy (his link in Chicago PD) isn't talking to him, and there's a full moon. Don't worry, Harry, your luck is about to change, unfortunately, it's from bad to worse. Though when trouble hits Harry Dresden, it hits pretty good, lucky for him, he can hit back. Murphy finally gets in touch with Harry and brings him to the scene of the crime. Good news is, the killer left a print behind. Bad news is, it's a paw print, a very large paw print. Harry quickly surmises there's a werewolf on the loose. Actually, there's quite a few, but more on that later. Anyway, the FBI show up, sans Mulder and Scully, and quickly declare the crime scene their turf and they seem to be taking this more personal than usual. But Harry and Murphy have enough information and Murphy reveals there've been a lot of killings during the last few full moons. Bob, the spirit in a skull which is Harry's helper, I'd guess you'd call him that. Bob instructs Harry on the ways of magic, how to make potions, and can find information for him. He doesn't always do this willingly and can be pretty snippy. I like Bob. Bob informs Harry there are several types of werewolves. One that uses magic to change into a werewolf, such as a wizard knowing only one spell. Another who uses some kind of magic object to change into a werewolf, such as a belt or a talisman. There's also another kind who turns into a werewolf due to a family curse, kind of like an heirloom. Harry discovers he's dealing with all three types of these. After being lead to one pack going through some management hostile takeovers, Harry makes himself target for the alpha dog. Realizing they had nothing to do with the murders because they can change at will, Harry tracks down some more leads. Turns out there's a man who's family was cursed years ago, centuries, even, into turning into a werewolf. He wants a doggie park during the full moon rampages so he's been buying up lots of land. Yet, one of the people he's been buying from might have been trying to snooker him, hence the first set of victims Harry comes across. The guy's partner, Marcone (not a nice guy) might be next, who Harry dealt with in the last book. But is Marcone in on it? While tracking the werewolf down, Harry runs into the werewolf's fiancee. They had a circle to contain the werewolf, but someone destroyed it. Harry smells a setup, but not just for the werewolf. Murphy shows up at the guy's house and locks Harry up and the werewolf. The fiancee helps Harry escape and they get to the police station in time for the werewolf to change and trample the police station. The werewolf leaves the station, giving Harry, the fiancee and her pack, and Harry's friend, Susan, time to regroup. But they're not the only ones. Another pack is staking their claim and plan to use Harry as bait, willingly or not. Eventually, Harry figures things out and works his magic to set things right or as right as he can make it. He's a wizard, but magic can't fix everything. I caught this series on SciFi last year and really liked the show. Naturally, the show's been cancelled, so I decided to read the books and see with this series came from. I am not disappointed. Butcher does a real good job of creating Harry's world and sticking to his guidelines. Harry faces many challenges, professionally, personally, and wizardly. This is one of the few series I've read that actually uses magic and the magical creatures aren't caricatures or a rehash of what the author thinks is funny or stupid in society. Butcher is also good at keeping up the tension, which I tend to have little patience with, so he gets high marks on that. I knew Harry would get out of the situation, but to do it sans deus ex machina takes imagination and skill. 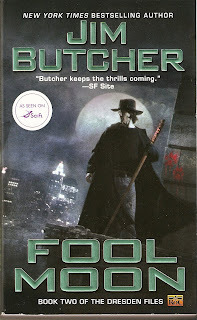 Butcher has plenty in the series, so I've got plenty to look forward to. does it take different methods to slay the various types of werewolves? or does the "silver bullet" trick work on all of them? i always thought that if i ever found myself sprouting fangs under a full moon (curse those family curses! ), the first thing i'd do is spend some time ingesting small amounts of silver, trying to build up a tolerance to it. According to Bob, silver only works on the werewolf if it's inherited; he blames Hollywood for such popular misconceptions. Lucky for Harry, he has a silver pendant his mother gave him which he used against the werewolf. Also, the silver bullet might only injure the werewolf, not kill it. Murphy made silver bullets out of the earrings her aunt gave her and it just wounded the werewolf, who healed up pretty good to attack the police force then, later, Harry. Bob said werewolves can be injured like any other wolf, except werewolves have a tendency to heal super quick. So if you're going to hurt one, do it quick and do a lot of damage. I don't think ingesting small amounts of silver would help, in Moon Called, the silver acted as a poison, like arsenic. It would probably do more damage than good. The poor werewolf had to sweat it out and it looked like it hurt. One of my favorite movies is The Princess Bride. In it, the dashing hero spends years ingesting small amounts of a deadly poison called Iocaine, just so he can build up resistance to it. Years later, it serves him well in a battle of wits with a Sicilian princess-napper. Surely, if such a thing happens in TPB, it has to have some merit. Iocane powder, I bet my life on it! I love TPB, it's so classic. But poisons are fickle creatures, sometimes it works to build up an immunity and other times it just slowly and painfully kills the person, sometimes, this method goes undetected ... or not. Silver's a metal so I think ingesting it might be counterproductive because it wouldn't be absorbed by the body as anyone who swallowed a coin would know. However, it makes me wonder if vampires have ever thought of taking garlic-holy water shots to build up an immunity to those items. Well, not to be TOO semantic, but Amanda, I know, used to take a particular concoction that included silver in it, that helped a great deal with her health problems, and in India, apparently, there are those who put very thin sheets of silver into desserts, to aid in digestion. Straight Dope article on it (and gold), says it's mostly harmless, unless you eat too much. But, it's difficult to say whether one could build up a resistance, since it's not an autoimmune response - it's a spiritual one, coming from the association of silver with the moon. Speaking of eating silver and gold, I think Serendipity in New York has the most expensive desert, garnished with gold; it runs around $1,000, I think. Interesting article. A quick search on ingesting silver brought up some strange findings. Apparently, silver can be an antibacterial, but was discontinued after the discovery of penicillin. Apparently, taking too much silver can cause your skin to turn ashen-blue, such as this poor guy Man's skin turns blue from ingesting silver. It can also cause organ failure.